2 Prepare to Fix a Leaky Radiator! 4 Is Your Radiator Valve Leaking? 6 Do you need to replace a radiator valve? 7 Is Your Radiator Leaking From The Spindle? 8 Is The Radiator Valve Or Gland The Cause Of The Leak? 10 Is Your Radiator Leaking Because Of Corrosion? 12 And If You Don’t Fix Your Leaky Radiator? There aren’t many things that can go wrong around the house that are as annoying as finding a patch of wet carpet or a pool of water around the bottom of a radiator – okay, maybe puppy training runs it close. . . But puppies aside, in this blog we’ll look at how you can fix a leaky radiator and minimise any damage to carpets and floorboards. The following tips should give you the tools you’ll need to identify the source of any radiator leak and get it repaired quickly before any major damage is done to your property. Prepare to Fix a Leaky Radiator! Before you begin it’s best to prepare for the worst case scenario – water pouring out of your radiator. Put some towels or another absorbent material on the floor around the radiator and have a large bucket to hand to catch as much water as you can. Now you’re ready to get fixing your radiator leak. Take one of your towels and completely dry the surface of your wet radiator. This will give you the chance to find the water leak – it’s very difficult to find the source of any leak if the radiator is totally saturated. Once your radiator is dry you should be able to isolate the source of the leak quite easily. Take some toilet tissue and systematically check each fixture (or union) on the radiator one-by-one: this should help you to understand where the leak is coming from. Radiator leaks come from one of three places – the body of the radiator itself, the bleed point, valve or tail and the pipe that fills the radiator with water. Is Your Radiator Valve Leaking? A leaky radiator valve is normally one of the easiest types of leaks to fix. A leaking valve normally occurs when the spindle packing contained within the valve starts to wear out or becomes damaged. This type of leak will normally occur when the valve is in a ‘mid-open’ position – the leak will normally stop when you fully close the valve. To repair a leaking rad valve you will first have to drain down the system to below where the leak is occurring. Turn off both the supply valve (where the water enters the radiator) and the lockshield valve (the plastic capped valve at the other side of the radiator) – remember to count how many turns it takes to close the lockshield valve. Get your towels and bucket ready to catch any remaining water that may escape from the radiator. Using an adjustable spanner, undo the union nut (the one between the feeder pipe and the radiator). Open the bleed valve to allow the rest of the water to leave the radiator and go into the bowl. Starting at the male end of the valve tail, wrap carefully with PTFE tape between 10-15 times. Re-tighten the union nut and open the bleed and lockshield valves (remembering how many times you turned it before to close it). When the water is restored to the system, re-check for any leaks and then close the bleed valve. Do you need to replace a radiator valve? Before replacing a radiator valve you’ll have to purchase a replacement: preferably the same type as your existing valve – a different kind may not properly align with the water pipe in the same way. Once you have a new valve you’ll need to drain all of the water from your central heating system. Unscrew the nuts connecting the water pipe to the valve and then unscrew the valve to replace it. Clean the threads at the end of the radiator before installing the new valve. Wrap PTFE tape around the threads of the new adapter (see above) and screw it into the end of the radiator, be sure to not overtighten and damage the fixing. Slide the valve cap-nut and a new olive over the end of the pipe and connect the new valve. Once the new valve is in place you’ll need to refill the system and bleed your radiators to remove any air. Be sure that you carefully check the site of the fitting for any leaks. Tips on replacing and installing a radiator valve can be found in the video below. Is Your Radiator Leaking From The Spindle? A radiator with a damaged spindle – that’s part of the connection between the pipework and the radiator – can sometimes be the main cause of a leak and thankfully, it’s easily remedied. Using a spanner, tighten the gland nut and see if the leak subsides. If this fails, undo the nut and wind some PTFE tape down into the spindle (see below) before tightening back up. If this still doesn’t stop the leak, you may have to drain down the system and replace the valve –failing that, it’s probably a good idea to call a plumber. Is The Radiator Valve Or Gland The Cause Of The Leak? Often, a leak at the radiator valve coupling nut can often be fixed by simply retightening the coupling. If this fails, you’ll need to replace the olive inside the coupling. To do this you have to drain the heating system of water and then loosen the nut between the leaking pipe and the radiator. Remove the nut and the fitting and take the olive off the pipe and replace with a new one – smearing with silicon sealant or winding it with PTFE tape before reconnecting. If this doesn’t work then you will probably have to replace the radiator valve altogether. Sometimes you may find that your radiator is leaking from under the plastic cap of the valve – the gland. If this is the case, it can be fixed quite easily with PTFE tape. Remove the plastic cap and gently unscrew the gland nut with an adjustable spanner, taking care to not damage the nut. Stretch a length of PTFE tape (about 20cm long) into a string and wrap it around the spindle of the valve – that’s the little bit sticking up. Using a small flat-headed screwdriver, force the PTFE tape into the body of the valve. Apply a little silicone grease to the tape and screw the gland nut back on tightly. Finally, replace the plastic cap and turn the valve back on. Is Your Radiator Leaking Because Of Corrosion? As with everyone and everything everywhere, stuff gets old – and your radiators are no different. The main culprit of radiator corrosion is sludge building up inside your rad and effectively causing it to rot from the inside out – this kind of radiator leak is more commonly known as a pinhole leak. Sadly there isn’t really any hope of ‘fixing’ a leak caused by corrosion, but there is a temporary measure you can take. If you have a feed and expansion tank – two water tanks in your loft that maintain the level of water in your system – adding a plastic resin sealant will stem the flow until you can purchase a replacement radiator. Note – You must NOT use this type of sealant in a sealed central heating system! If your radiator is corroding and a leak occurs, regardless of any temporary measures you take, you will have to get a new radiator: thankfully, we stock a few. When you have replaced your leaky old radiator with a shiny new one, be sure to add a rust and corrosion inhibitor to the water; this will ensure that the problem doesn’t pay you another visit a few years down the line. 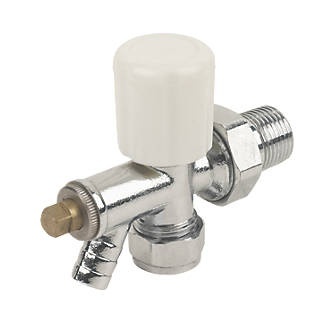 In a modern central heating system compression valves are normally used to join the pipes to the radiators. If one of these joins springs a leak, it is possible to perform a quick fix by tightening the valve with a spanner. Drain down the system to below the source of the leak. Take a spanner and undo the nut at the joint of the leaking pipe and pull the pipe free. Where the face of the olive meets the joint, wrap a couple of turns of PTFE tape around and then re-tighten the nut. And If You Don’t Fix Your Leaky Radiator? Regardless of what you do, sometimes it’s best to call in the professionals and get them to do the leak fixing for you. The last thing you want to do is make a minor problem worse by fiddling with something that you shouldn’t. For more hints and tips on all things home heating, subscribe to our YouTube channel, like us on Facebook and follow us on Twitter. Good luck with that leaky radiator, stay safe and happy heating! A radiator of mine once leaked while I was out at work and water was firing out all day from the upstairs landing, down through the ceiling landing on the oak table in the dining room, the oak had warped and the table was ruined! I should have checked the internal corrosion earlier! Aww no Jeff, that’s an awful story. There are a number of things that you can do to avoid this kind of thing in the future. To get rid of radiator sludge (the cause of the corrosion), you could get your system power flushed, but that can be very expensive. The average UK quote is between £500-750, so be sure to look around if you take that route. Alternatively, you can drain down your system – we have a guide for that in our Advice Centre – and add a range of chemicals and anti-corrosion liquids to help. Most plumbers would recommend that you do this every 5 years or so. Good luck and let’s hope you don’t have any leaking issues any time soon. I’m glad you liked it. Make sure you send your friends here if they are unfortunate enough to suffer a leak! Loving the guide, has everything one could possibly need to know to fix a radiator! I could have done with this a few weeks ago when we ran into a minor “issue” with the radiator in the spare room at our new place. Oh well, now i know where to turn to in the future, thank you. Thanks Sara Lou! I hope you’ve got your issue sorted now. Happy heating! how do you remove the control knob from the valve – there is no obvious screw to remove it on the top/head? Hi Martin, If you mean a white one like this – https://uploads.disquscdn.com/images/1acc9a51f5f7e804f71f77da22adbadc2cecf89178d4a611eac8291e100279d4.jpg – it should just pop off with a bit of pressure. I think there is a slow leak in the pipe connecting to the radiator, its the one not connected to the temperature side. It’s literally a drip leak, can this be fixed with solder or some sort of adhesive or would the pipe need replacing? here’s a guide we did about that http://www.bestheating.com/info/blog/advice-centre/how-to-guides/how-to-drain-down-a-pressurised-system/ and replace the pipework. If it is so far gone, I wouldn’t recommend soldering it, because you’ll only have to come back and do that again later. It’s probably best to just change it. If you do have any problems, be sure to consult a professional engineer. black sticky goo out of top of radiator joint a leak??? Sorry it’s taken so long to come back to you. There seems to be some kind of issue with us receiving these replies. If you haven’t already, I would suggest looking at get a new set of valves, or maybe changing the olive (the little copper ring inside), it may be the case that it has eroded over time. Sorry again for the late reply, I hope this is fixed. Hi, I had to take off a radiator for decorating but now can’t get the nut from the valve to do up onto the thermostat. It turns a few times but then seems to slip off. Do you have any tips to solve this? Hi Paul, that’s a bit of a strange one. If it’s a panel radiator then it could be that you haven’t put it back in exactly the same place and perhaps need to check that it is properly aligned or centred, because the pipes don’t give you much room for manoeuvre. It all depends on the radiator you have really. I would be very surprised if there was damage to the thread, but that may also be a case, though very rare tbh. Without seeing it, I can’t really offer much more advice. check that the rad is in the same position it was before you decorated and ensure that it is balanced correctly on either side. Other than that, I’m sorry, but I’m at a bit of a loss to explain the reason behind it not fitting. I have a leaking radiator at the top and it has a brown water mark all down the side of the radiator. It’s only leaking when the radiator is off. I have an Ideal boiler, which since moving here has not been good. The boiler had to have a filling loop and now the pressure item is all over the place. I was told it must not drop below 1 1/2, which after a couple of months it did, so I called Ideal Boilers and while I was talking to them, the pressure item went to 3 which shocked them, but I don’t know how long the radiator has been leaking and if it is connected to the boiler problem. I don’t know what to do!! What is the problem Yasmin? My radiator is leaking when it come on from the knob or valve whatever it called the water comes out when nthe heat is on. These radiator are OLD. My house was built in 1927. Have you tried to tighten the valves? That would be my advice in the first instance. If they are really old, the thread may have become a little worn. Perhaps it’s time to invest in some shiny new radiator valves. All my radiators leak and my landlord is never able to fix them. The leak is not coming from the knob side, but what seems to be some form of exhaust cap. Is there anything I can do to remedy this situation so that I can actually turn the heaters on? Hi Christopher, that’s a bit strange. I don’t know what you mean by an exhaust cap. To be perfectly honest though, your landlord has a duty of care to ensure you can use your heating, so if he/she is not keeping up their side of the bargain, then I would consider asking citizens advice about how best to move forward. As for the radiators themselves, have you tried to tighten up the valves on the radiators and seeing if that makes a difference? I’m struggling to offer a solution based on the info you’ve given me, I’m so sorry. I wish I could offer better advice and help you find a solution. Hi, I believe all my radiators have busted and leaked due to being frozen. They were over a week late delivering fuel and it ran out. Unfortunately, I wasn’t living there yet and didn’t know. Walked in and theres ice and dirt lines in front of every radiator. They are all busted due to ice, along with 1 pipe that carried water to the upstairs. Is this fixable? Or do I need all new radiators. Hi Rona, what an upsetting scene that must have been. I wouldn’t imagine that the radiators have busted and lost any structural integrity though. The likelihood is that the damage has been done where the radiators meet the valves (usually at the side of the rads). This would be the weakest part in an event such as this, so the radiators are probably ok. I can’t be certain of that. obviously, as I am not there on the ground, but in my opinion a radiator shouldn’t be busting open when the temperature drops and it isn’t in use. So I would wager that the rads are fine. I would recommend speaking to a heating engineer about the damage done and provided that the threads have not been damaged where the valves connect to the radiators, you may be able to salvage the system. As for the pipe upstairs, if that is busted, it will need replacing. I hope this helps, but the best advice I can give is to get an engineer on the ground to take a closer look. Good luck, and please let me know how you get on. Hi Patricia, I’m sorry, I don’t quite know what you mean by an overflow. It could be a lockshield valve, that you would use to balance your radiator system, but without seeing it, I don’t know what you mean. I would recommend contacting a plumber. I would love to be able to help you, but it would be easier to have someone on the ground take a look at it for you.